Fr. Adrian Mercado San Juan is a diocesan priest of the Archdiocese of Los Angeles and an aggregate-in-process (vir agregatus) of the Marians of the Immaculate Conception of Stockbridge, Massachusetts. 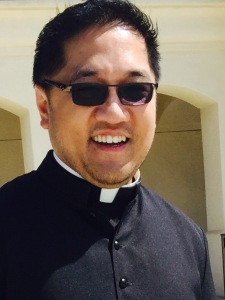 He was born in Manila, Philippines in 1976 and his immediate family live in Walnut CA and are parishioners of St. Lorenzo Ruiz-Walnut and St. Elizabeth Ann Seton-Rowland Heights. His assignments as associate pastor include St. Peter Claver-Simi Valley at present; Divine Saviour and St. Anne Parishes in Los Angeles; and St. John the Baptist-Baldwin Park. He served two years as administrator at St. Madeleine in Pomona. Fr. Adrian also served the Archdiocese of Manila for 5 years ministering in the parochial Catholic school system, particularly in campus ministry and integral formation of teachers. Father holds a Bachelor both in Classical Philosophy and Sacred Theology, a Master in Pastoral Ministry and another Master in Educational Management. He was formed by the Society of Jesus (Jesuits) and ordained on March 20, 2004. Fr. Adrian is a stage 2 testicular cancer survivor and indebted to the Divine Mercy, Our Lady and St. Therese of the Child Jesus for his healing.